Positive Feedback - Great....Two thumbs up for me.....Its so easy to post my ads. MYBENTA helps a lot in boosting my online sales. 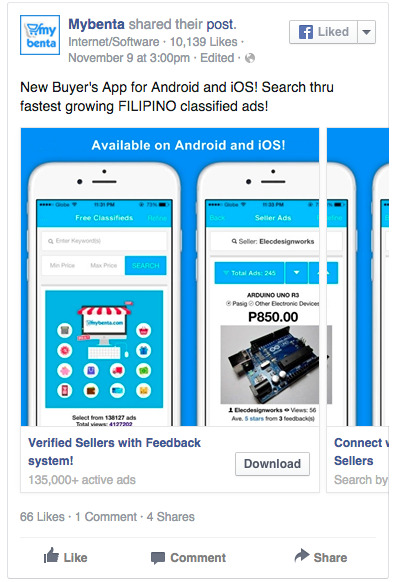 Posting ads is hassle-free-- no unnecessary feaatures and no inessential screening process that kill legitimate ads like my products--unlike other classified ads sites. I also love its layout, simple and user savvy. I am also looking forward for its mobile app. This is a promising classified ads website! More power MYBENTA! Positive Feedback - As a real estate broker, this site has helped me a lot in getting inquiries on various properties I am selling. Thanks. Positive Feedback - Most of our sales nowadays come from MYBENTA. We are proud to be an active seller here. Thank you.